Seeing that so many people in America are overweight, it's no surprise that one of the chief focuses of the Paleo Diet is weight loss. That's all well and good, but what about thin people going on the diet? In our case, because of the already low amount of body fat when we began the diet, we've only lost a couple pounds at most (maybe some subcutaneous fat loss around the abdomen). Less sleepiness throughout the day (necessitating less caffeine) has been one benefit, as well as less heartburn. Ironically, the Paleo Diet has increased our vegetable intake because instead of grainy carbs, we have an extra helping of veggies. Other benefits (insulin sensitivity) have been passive thus far. What benefits (or problems) have other thin folks experienced when transitioning Paleo? Can anyone comment on their experiences on the Paleo Diet if they were already skinny when they started it? I encouraged a girl I know to try eating paleo for a while, she is like a rake, so thin. She has several health issues. She hasn't tried yet. There is a difference between being thin and being lean, she is the former. 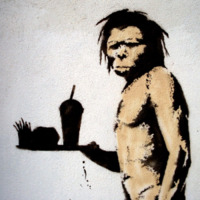 A great account of the positive effects paleo eating has on the body and mind. My experiences are largely similar to yours (aside from the PMS thing...as I'm a guy ;-)). The desire to move and to exercise is probably my favourite benefit, but my clear skin, bright eyes and overall positive attitude (I have a history of severe depression) are just some of the things that come to mind when I think of how paleo eating has helped me. I too lost a bit of weight but now I seem to be 'stable' and am making great gains in the gym. Yep--the most notable improvements paleo brought me weren't about weight loss. I did lose about 8-10 pounds (all in the midsection, as you said), but people called me "skinny" before I started paleo (went from 112-115 to around 105-106, 5'3"). -More energy, and no energy crashes in the afternoon. -Clearer skin, brighter eyes, and shinier, healthier hair. -Not feeling constantly hungry, which was incredibly distracting at work. I could probably keep going, but these were the changes I was most pleased with. I have always been a thin person and had a high metabolism, but I was diagnosed with Celiac Disease in 2007 and decided to go 100% Paleo for the health benefits which the diet provides. I had no desire to lose any weight whatsoever ( I was 5"10, 145 lbs, size 6 20% body fat) But after 3 years on the diet, I found that increasing my fat intake in each meal( more olive oil, nuts, nut butter) with my protein and veg/fruits, leaves me full and satisfied. I also workout now ( crossfit) 2 to 4 days a week. I am now 150 lbs, size 4, and 17% body fat. I have increased my muscle mass, decreased my body fat, and gained 5 lbs, and dropped a full dress size. You do not have to lose weight on Paleo if you don't want to. My answer is to increase your "good fats" with each meal if you would like to maintain/ or stay close to where you are. I attribute my 5 lbs in weight gain as muscle. I feel fantastic. I haven't had any stomach problems in years, my skin is clear, my hormones are regulated, and I have endless amounts of energy. My Wife's Asthma was cured, my body fat has decreased by about 5-6% with hardly any change in weight, my seasonal allergy symptoms have decreased (not cured), my Keratosis pilaris symptoms have improved a great deal, post nasal drip symptoms in the morning have disappeared. Energy is great, I can go a whole day without food and not get that weak dizzy feeling. Overall health markers are awesome, less digestive issues, less pimples (not that I had many before). I am sure there are much more, but I can't think of them all. By the way, all this comes with eating about 4000 calories per day on average. Not that calories necessarily matter, but for those people that think they do 4000 calories and I am only 5 foot 8 inches and 157lbs, fairly active but with a sedentary desk job. I've always been thin and I'm a guy so really looking to gain some muscle mass rather than lose any weight. I'm just starting a gradual transition to the paleo lifestyle for health and digestive reasons but I can already see the difference in the way I feel. I've also been doing lots and lots of reading on paleo and similar diets. I hate to do anything cold turkey but I've been eliminating high glycemic index foods (especially grains) and increasing my protein, fat, and general veggie intake. Here's my inexperienced two cents... a thin person doing paleo for reasons other than weight loss should focus less on eliminating carbs and more on eliminating processed foods, grains, juices, etc... There are plenty of good, paleo-friendly carb sources that will leave you feeling great without all the SAD downsides. It's far from exhaustive. I'm also learning to make things like paleo banana bread, etc... but the main thing is reducing grains, increasing meats, eliminating things like pastries and most candy (and anything highly processed), and chowing down even more fruits and veggies than I used to. Oh, and nuts and dried fruit are big, lots of trail mix type stuff for snacking hunger pangs. I'm letting a little bit of rice remain in my diet, along with white potatoes, which most weight-loss paleo people totally avoid.